I thought that I would do something new today, and that's posting my own Waiting On Wednesday. Waiting on Wednesday is hosted over at Breaking The Spine, and is a chance for people to share those books that we're breathlessly anticipating! This week I have a book for you that is actually a sequel to a book that I read as a part of my 2016 Diverse Books Reading Challenge - you can follow the link if you want to read more about that! As the image says, this is not the final cover! 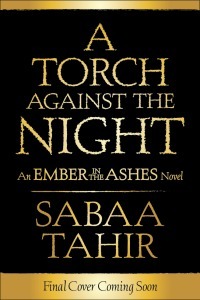 A Torch Against The Night by Sabaa Tahir is due out in August of 2016, and it is the sequel to An Ember In The Ashes, a fantasy set in a Roman-esque world. I don't want to paste the summary here because I don't want to spoil anyone on the first book, but I loved the first one and will have a review posted in the next week or so. Set against a backdrop that is both brutal and fascinating, the series tells the story of Leia and Elias. Leia is a Scholar, a downtrodden and oppressed group of people who were conquered by the Martials. Desperate to save her brother from the clutches of the Martials, she will do just about anything even though she's terrified. Elias is one of the Martials and also one of their elite soldiers - but he wants more than the life he's expected to lead. There's also a cast of supporting characters who are in their own ways awesome, terrifying and compelling, and the world building is fantastic. There's also friendship and romance and rivalry and action. I couldn't be more excited to get my hands on this next book! Great pick! I recently bought an Ember in the Ashes and I can't wait to finally read it. Oh, I hope you enjoy it! Your pick for this week looks intriguing!! An Ember in the Ashes is on my TBR shelf, but I just haven't been able to get to it yet. I hope I can get to it soon though! Glad you enjoyed it and I hope you like this book just as much! Thanks for visiting my WoW and welcome! I love your header by the way, it's beautiful! I think we all have those books that we really want to read on our TBR, but we never quite get to... :) I hope you enjoy it if you get a chance to read it! And thank you! I'm still impressed that I managed to get things working, thank god for templates! I haven't read the first book in the series yet but I've heard so many good things so I'm looking forward to reading both books. Eek, I haven't read the first yet! I've got it, though, and might wait for a copy of this one, just in case the ending blows my mind and I NEED it. :) Great pick!